We have a limited number of Gothic Arches and Roman Arches ready to despatch. 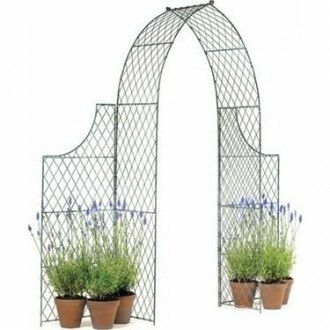 The 15% discount applies to all standard sized wirework arches in widths of 3′ and 4′ in the authentic plain zinc galvanized finish. The arches are made and despatched in two halves for re-bolting together at the top once delivered; each corner has 15″ long legs for pushing or concreting into the ground.